Advanced SteadyShot™ for smoother, blur-free footage with 11.1 megapixel back-illuminated CMOS sensor and ZEISS® Tessar lens for crisp resolution. Up to 3x smooth zoom and 2 angle setting modes for perfect field angle adjustment. Enhanced camera body for improved usability and supplied Underwater Housing for up to 60m depth range. Great movie functions with XAVC S 50Mbps high - bitrate and 120p/100p high–frame rate recording at for incredible slow-mo footage and 4K Time-lapse capabilities using Action Cam Movie Creator. 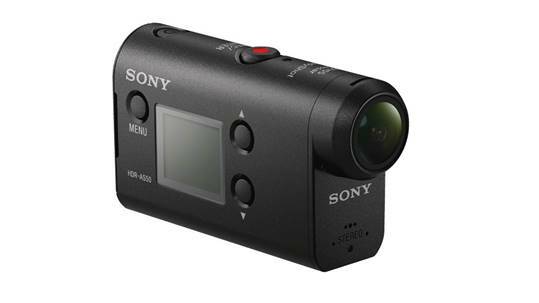 (SINGAPORE, 1 March 2016) – Relive your every-day adventures and capture stunning point-of-view footage with Sony’s latest HDR-AS50 Action Cam. Whether you’re travelling, enjoying water sports, cycling or just strolling around, the HDR-AS50 allows you to capture those experiences and relive them in mesmerising HD movies. The HDR-AS50 has an 11.1 megapixel back-illuminated CMOS sensor paired with a ZEISS® Tessar lens, capturing your content in crystal clear high definition resolution. It uses advanced SteadyShot™ which is three times more powerful than its predecessorand also used in the range topping FDR-X1000V, which delivers judder-free footage when shooting everything from motocross to aerial landscapes. The stabilisation system is especially effective against low amplitude vibration, which can occur when used with radio-controlled helicopters or drones. Capturing clear and steady footage of action sports is no longer problematic as shakes and blur during skydiving, running or cycling are effectively compensated for. The HDR-AS50 comes with a large range of accessories to further enable you to preserve life’s moments. Divers and swimmers can now benefit from a supplied Underwater Housing for the HDR-AS50, which allows footage to be captured down to 60m under water. The housing is perfectly designed to protect your Action Cam from damage and is therefore not only extremely tough but also dust-, shock and waterproof. The designated flat lens allows you to capture incredibly clear underwater footage. An optional Cap Clip (AKA-CAP1) is a perfect accessory for any casual use such as travelling or fishing.